The Township Committee presented certificates of appreciation to individuals who submitted photographs that were used in the 2018 Township Calendar. 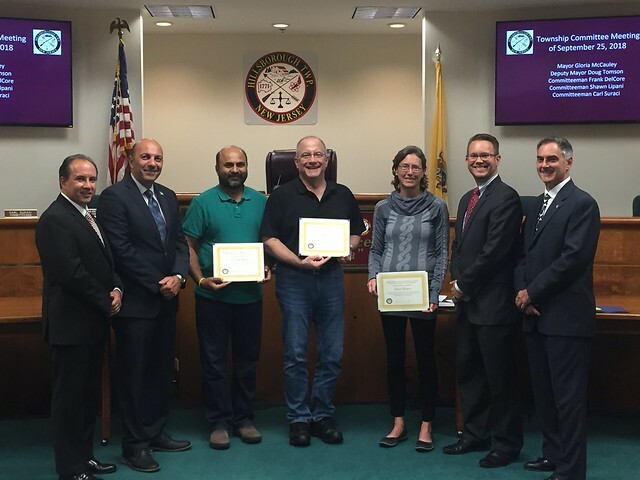 Kristi Hakim, Chandra Hari, and Gary Wiesner were recognized at the September 25th Township Committee meeting. Each year, Hillsborough Township works in conjunction with Town Planner Calendar to produce a color printed calendar which will that is mailed out to every residence in Hillsborough, at no cost to our taxpayers. The printing of the calendar is funded through the various advertisements contained within the calendar. The 2019 Calendar is currently being assembled and will be mailed out in December. It is set to include various schedules, important dates and phone numbers for the coming year as well as twelve photographs featuring Hillsborough Township’s landscape and scenery.